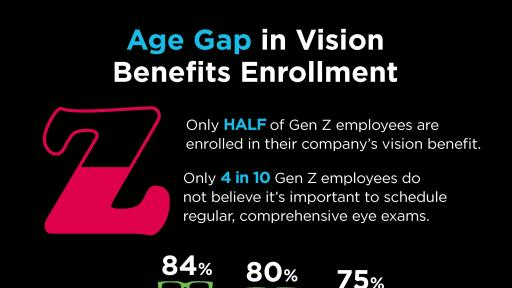 Transitions Optical Survey describes the age gap in employee vision benefits enrollment. 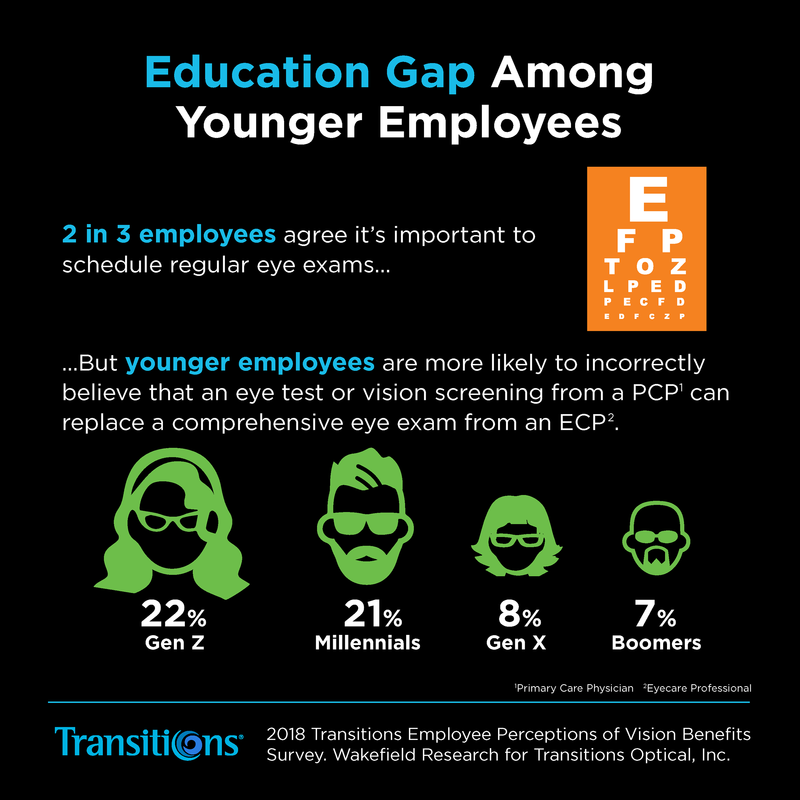 Younger employees are more likely to incorrectly believe that an eye test or vision screening from a Primary Care Physician can replace a comprehensive eye exam from an Eyecare Professional, according to Transitions Optical Survey. 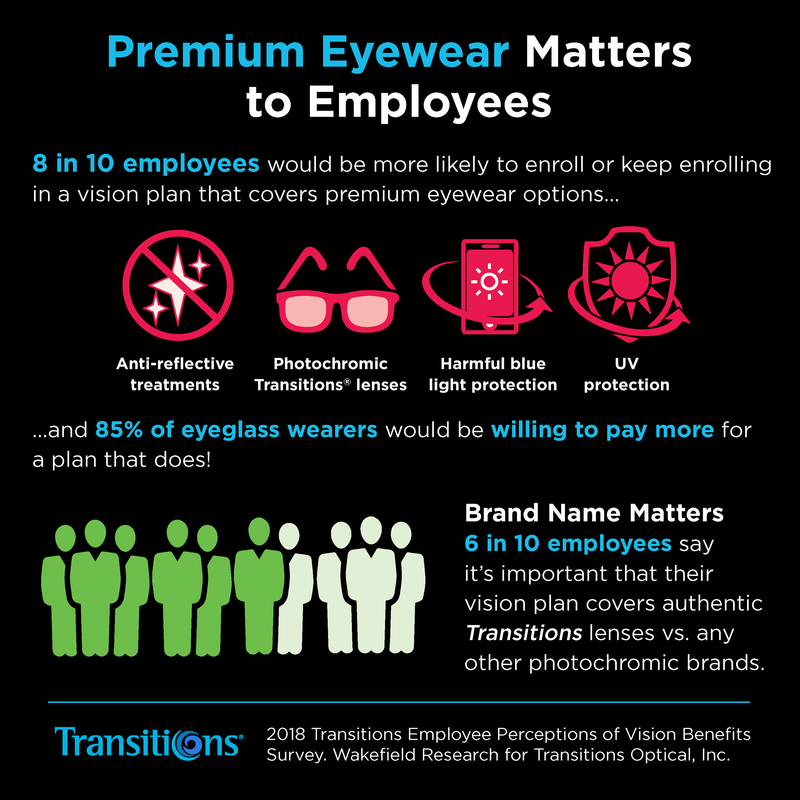 Transitions Optical Survey reveals 8 in 10 employees would be more likely to enroll or keep enrolling in a vision plan that covers premium eyewear options. PINELLAS PARK, Fla., February 12, 2018 – While enrollment in vision benefits remains high among all employees, new research reveals that younger generations—who continue to make up an increasing portion of the workforce—are not only significantly less likely to enroll, but are also less likely to understand the importance of regular, comprehensive eye exams. 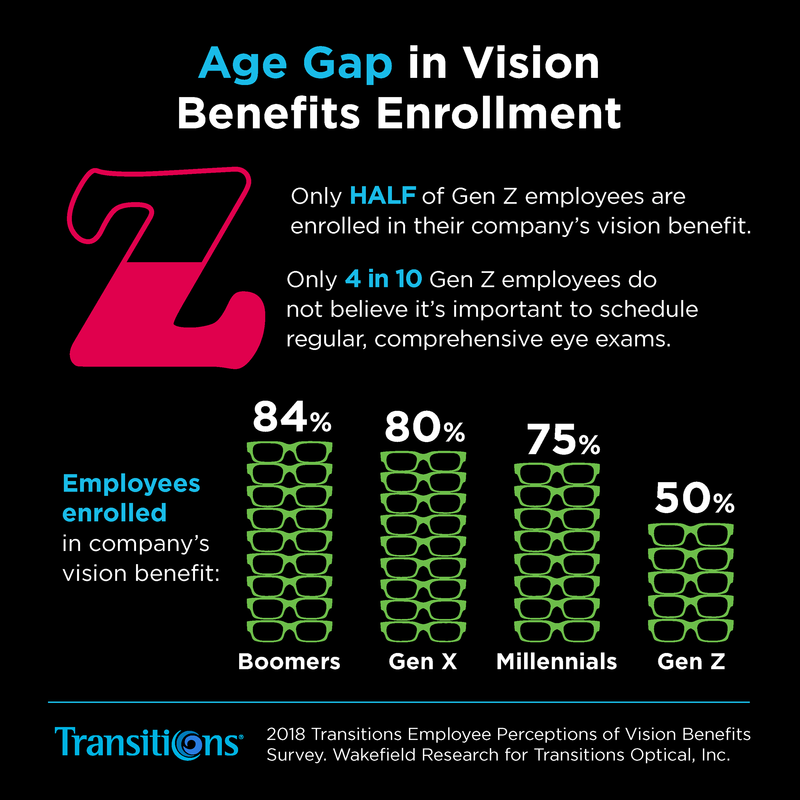 According to the ninth annual Transitions Optical Employee Perceptions of Vision Benefits survey, while 76 percent of employees overall are enrolled in a vision benefits program—Millennial and Gen Z employees are significantly less likely to enroll in or utilize a vision plan. According to the survey, while 84 percent of Baby Boomers and 80 percent of those in Gen X are enrolled in a vision plan, just 75 percent of Millennials and only 50 percent of those in Gen Z say they are enrolled. Further findings indicate that this could be due to a lack of education—including a misunderstanding of what comprehensive eye exams detect vs. vision screenings, and not knowing what benefits are included as part of their vision plan offering. 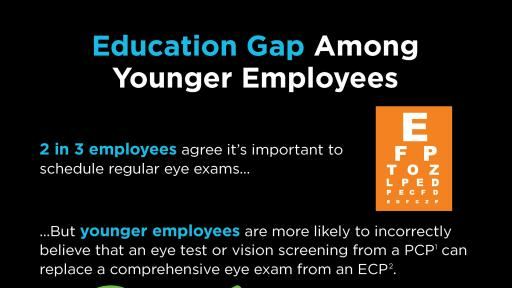 While two-thirds of employees overall agreed that it’s important to schedule regular, comprehensive eye exams with an eyecare professional, the survey revealed an education gap among younger employees, particularly those in Gen Z (60 percent believe it’s important vs. 67 percent of all employees). Additionally, the survey also uncovered a lack of understanding of what comprehensive eye exams include—particularly among younger employees. More than one in five Millennial and Gen Z employees incorrectly believe that if they receive an eye test/vision screening from their primary care physician, they don’t need to schedule a comprehensive eye exam with their eyecare professional—compared to just 8 percent of those in Gen X and 7 percent of Boomers. The silver lining is that nearly all employees (96 percent) say they’d be more likely to use their benefits if they better understood what their plan covers, reinforcing a need for education. Millennials were the most likely to say they’d be “much more” likely use their vision benefits if they better understood them (56 percent vs. 49 percent of all employees). The survey indicated that lack of coverage of premium lens options may also be a factor in vision benefits enrollment and utilization. In fact, when asked which types of lens options are most important for their vision plan to fully cover, one in five employees said lenses that protect against UV rays—with this being the top choice for Gen Z. Additionally, when asked if employees would be more likely to schedule an eye exam if their vision plan covered one or more premium lens options, 92 percent said they would, with little differences across generations. The vast majority of employees (95 percent) agree that they would be more likely to enroll in their company’s vision plan if they knew more about the importance of comprehensive eye exams and the specific, premium eyewear offerings available through their benefits. Six in 10 employees say full coverage of premium lens options or enhancements (such as photochromic lenses or anti-reflective treatments) would help motivate them to enroll in a plan if they weren’t previously enrolled. This was the top motivator among Millennials and those in Gen Z. More than half of employees say they would be more likely to enroll in their company’s vision plan if they better understood that eye exams could provide early detection of serious health issues. Premium lens options, like anti-reflective treatments and photochromic lenses—which adapt their level of tint in changing light to enhance and protect vision—are desirable among employees and are a major factor when considering enrollment. 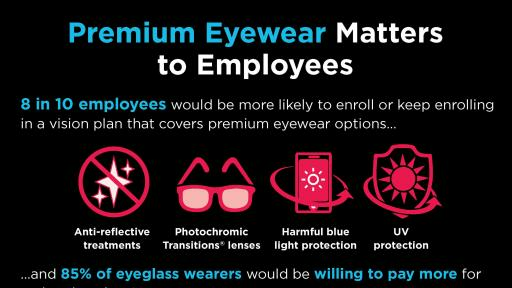 Eight in 10 employees overall say they would be more likely to enroll or keep enrolling in a plan if it covered premium eyewear options, like photochromic Transitions® lenses—with four in 10 saying they would do so even if it meant a small increase in cost. Of eyeglass wearers specifically, 85 percent of employees say they would be willing to pay more for a vision plan that fully covers premium eyewear options—with Millennials the most likely to say they’d be likely (92 percent) or very likely (55 percent) to pay more. The survey also confirmed that brand name does matter to employees—and can impact enrollment trends. More than six in 10 employees (62 percent) say it’s important to them to have authentic Transitions lenses covered by their vision plan as opposed to other photochromic brands—with little difference across generations. Furthermore, offering employees access to premium eyewear options can help ensure that those who do enroll in their vison benefits are actually taking advantage of them. Nine in 10 eyeglass wearers (92 percent) say they would be more likely to schedule an eye exam within the next 12 months if their vision plan covered one or more premium lens options. “Bringing premium lens options into the discussion during the benefits enrollment period—and throughout the year—can be a powerful way to ensure more employees understand the value of vision benefits, and are taking advantage of their company’s offerings,” said Drew Smith, director, North America channels, Transitions Optical. “Good vision goes beyond just seeing 20/20—certain lens options, such as photochromics and anti-reflective treatments, can help to enhance vision to boost employee productivity and overall satisfaction.” To help elevate the importance of comprehensive eye exams and quality eyewear available through a vision benefit, Transitions Optical offers a variety of employee and employer focused tools and education. These can be accessed free of charge at HealthySightWorkingforYou.org.